Central Auto Auction Delivers — Pizza! 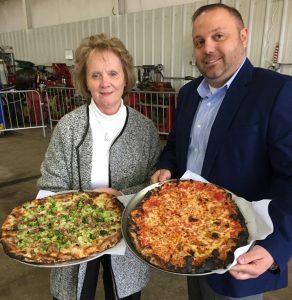 HAMDEN, CT, Feb. 27, 2018 — Central Auto Auction celebrated its 12th Anniversary in late February with a huge pizza party catered by the popular New Haven Pizza Truck. Office Manager Sally Saldamarco and Sales Manager Anthony Saldamarco serving lunch from the New Haven Pizza Truck. Auto industry veteran Peter Saldamarco opened the facility in on Feb. 26, 2006, after spending nearly four decades in the auto industry. The anniversary sale also heralded the opening of a brand new fourth lane to the fast-growing auction. Vehicles were bought up faster than the pizza slices disappeared. The sale ran more than 450 units, and had 366 active buyers in the lanes. Attendees were treated to the best pizza New Haven has to offer. Saldamarco said he was very proud of the sale, and that he believes quality overshadows quantity. He added that this philosophy is evident not only in the quality of the vehicles offered, but in the integrity with which the staff at Central Auto Auction operates.